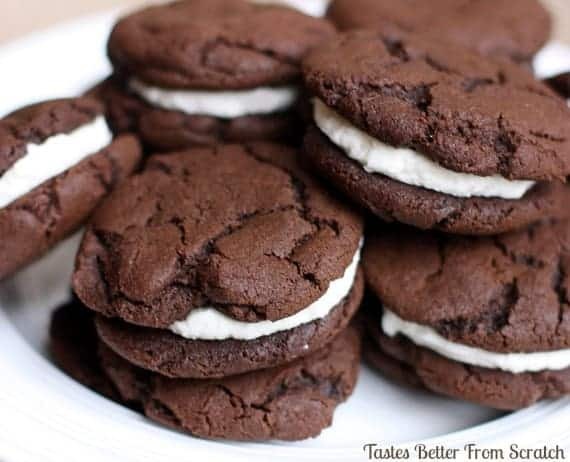 Perfect homemade Oreo cookies that your whole family will drool over. Whether you’re four or forty years old, I think just about everyone loves Oreo cookies! And, just like the store-bought versions, you wont be able to eat just one of these! I remember my mom making these when we were little and we loved helping her put the filling between the cookies and smashing them together. We’d always have to hide one or two cookies in a secret place because when the boys came home from school these cookies were gone! I have two recipes posted below. One is a truly homemade oreo cookie, and the other uses a cake mix. If you’re in a time crunch, the cake mix version have been a family favorite for years! Otherwise, you wont be sorry for making the Homemade Oreo Cookie recipe, courtesy of the fabulous Sally from Sally’s Baking Addiction! Do you follow her blog? You should. She’s a baking whiz! 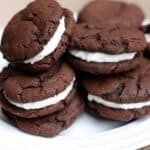 The cream filling in this recipe replicates (in a way yummier way) the filling in store-bought Oreo cookies. 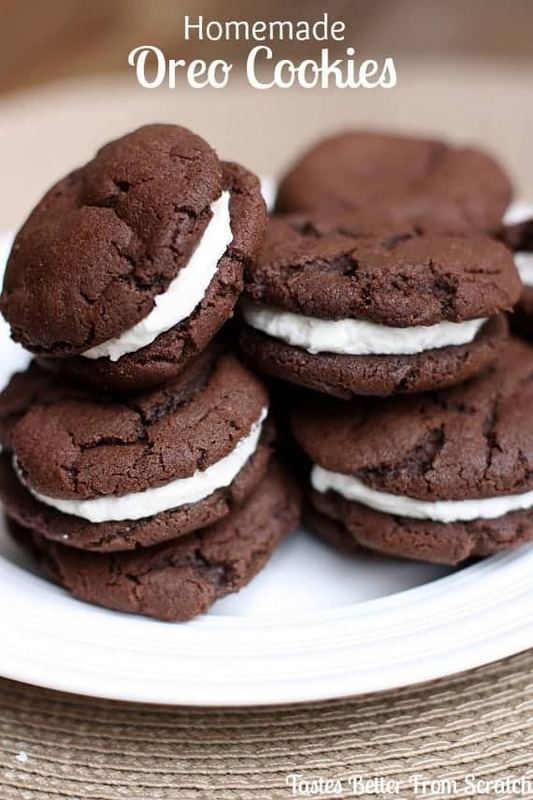 My mom always made homemade oreos with cream cheese filling in the middle and so I prefer them that way. You can substitute the shortening with 4 ounces of cream cheese, and keep everything else the same. To make homemade mint Oreos, add 1/4 teaspoon of peppermint extract and a a drop or two of green food coloring to the cream filling. YUM! Perfect homemade Oreo cookies that will have your whole family drooling! 1/4 cup vegetable shortening , or 4 oz of cream cheese if you'd like a cream cheese frosting for the filling, instead. Add the flour, cocoa powder, baking soda, and salt to a large bowl. Set aside. Add the butter to a mixing bowl and beat on high speed until creamy. Add granulated sugar and brown sugar and mix until well combined. Mix in egg and vanilla extract. Add the dry ingredients and mix on low speed until combined. Cover the dough and chill for 30 minutes. Remove the cookie dough from the refrigerator. Line two large baking sheets with parchment paper. Roll the dough into small, 2 teaspoon sized balls. You should be able to roll about 30 cookie dough balls. I can fit 15 on each of my cookie sheets. Press down lightly on the top of the balls to slightly flatten. Bake for 6-8 minutes. The will appear soft but will continue to harden as they cool. Cool for 5 minutes on the baking sheet, and then remove to a wire cooling wrack to cool completely. Add powdered sugar and vanilla and mix for 1-2 minutes, until smooth. Once the cookies have cooled, add a small spoonful of filling onto the inside of a cookie. Place the inside of another cookie on top and press together. Cookies store well, covered in the fridge, for up to 1 week. They also freeze well, up to 2 months. Filling can be made up to 1 week ahead of time, stored in the fridge. Allow to come to room temperature before filling cookies. *I used salted butter in the cookies and frosting. You can use unsalted butter and add a tiny pinch of salt to the fry ingredients of the cookie batter. *If you'd rather make a traditional cream filling (instead of cream cheese), substitute the cream cheese with 1/4 cup vegetable shortening. Recipe makes 15 sandwich cookies (30 single cookies).